Race and Religion: Islamophobia or Christian Jihad? Franklin Graham, the son of Christian evangelist Billy Graham, and head of the Billy Graham Evangelistic Association, was interviewed on MSNBC back in February of this year. In the interview, the Reverend Graham, as a representative of one of the most influential evangelical Christian organizations in the world, was asked if he considered President Obama a Christian. His now famous response can be summed up in one word: maybe. When questioned further, he made a statement that should give us all pause. He said he “can’t say categorically…” that Obama is not a Muslim, because Muslims have gotten a “free pass” under the President’s administration, creating a situation in which Christian minorities in the Arab world are being attacked and killed by Muslims. In about 30 seconds, Graham summed up the position of much of the right wing of the evangelical Christian movement in America. That is, to be a Christian, one must be opposed to Islam. The two religions cannot peacefully co-exist. Welcome to the culture wars, what I un-affectionately refer to as the right wing Christian jihad. From the people who gave us trans-vaginal probes and the war on drugs, all new and repackaged for our convenience, here is a new way of dividing up humanity that ultimately serves the interests of the rich. By cooking up Islamophobia (the fear and loathing of Muslims), they are ginning up a war of worlds – a fight for control of coveted natural resources and geopolitical position disguised as a war on terror. The domestic foot soldiers of this war are motivated by a belief that Christianity is under attack by queers, feminists, immigrants, (Black) drug criminals, and, especially since 9/11, by Muslims. To the jihadists of the right, Christians are challenged to no longer define their faith via their individual relationship with Jesus. They must promote their faith through the political process in order to protect it from insurgent “others” who threaten traditional Christian morality and the security of the Christian community. This reasoning is nothing new. In the name of religion, a form of racism was justified that resulted in the near genocide of the indigenous people of North America. 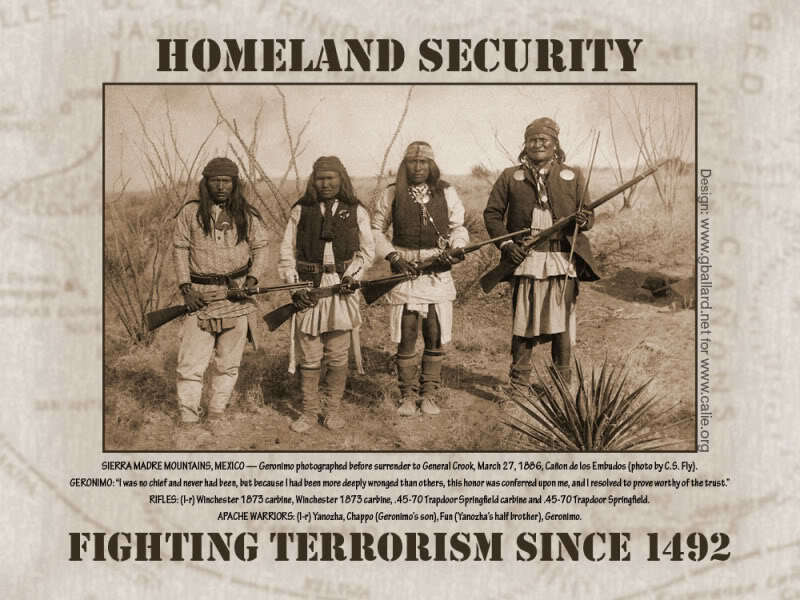 Starting in the early 1600s and extending to the 1920s, what has become known as the American Indian Wars either directly or indirectly resulted in the native population dropping from approximately 1,000,000 (many suggest this number should be multiplied by 8 or 9) at first contact, to about 250,000 by the end of the 19th century. The Puritans believed that native peoples were savages. Unless converted to Christianity, they were subject to servitude or simple eradication. By the 1800s, the ideology of Manifest Destiny, the belief that the Anglo Saxon race was destined to expand across the North American continent bringing civilization and “progress” in their wake became the popular justification for a federal policy of “Indian removal.” That same ideology drove us to war with Mexico in 1846, the spoils of which included all or part of Texas, California, Nevada, Utah, Kansas, Colorado, Wyoming, Oklahoma, New Mexico, and Arizona. That’s right, the most anti-immigrant state in the U.S. also happens to have once been part of Mexico. While Africans during this same period were cast as animals to justify slavery, native people were cast as “heathens” to justify native “removal” either by genocide or forced treaties that often involved trading resource rich territory for poor scrub land. They are the flip sides of the same ideology; one that begins with an assumption of white, Christian supremacy. This was jihad, American-style. It’s a tradition we seem determined to continue. And, as always, those chumming the waters are motivated less by religion than by their desire to acquire resources. Land, minerals, food, timber, oil. The commodities may change over time, but the dynamics remain largely the same.